It was just a throwaway comment when I uttered the sentence, but it seemed like a good idea at the time. Then again, this is me (think “Tom, you idiot”). 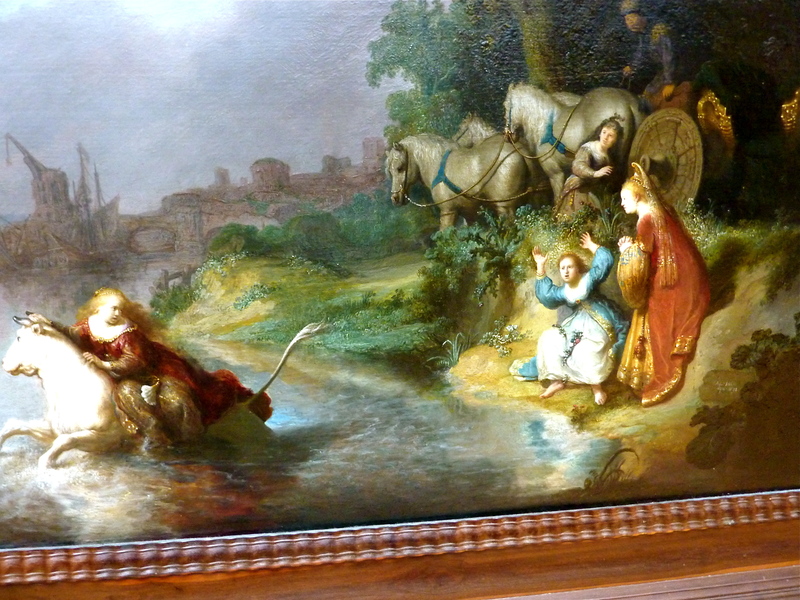 Late in the day, after viewing dozens of objets d’art, I said to one of the stern and unsmiling people who ensure children don’t wipe boogers on paintings, “It’s hard for me to believe that people can actually walk into these art museums and walk out with, let’s say, a Rembrandt under their arm and not get caught.”Little did I know (actually those four words should be etched on my headstone) that less than 24 hours before, a 1655 Rembrandt sketch had been swiped from that famed Orange County art museum, the Ritz-Carlton Marina del Rey (“stay two nights and take home an original Rembrandt for free”). Although not particularly amused by my comment (Tracy told me later that discussing stolen art to a Museum guard is not the most prudent idea), at least he didn’t cuff me and force me to spend a day at a Picasso museum. 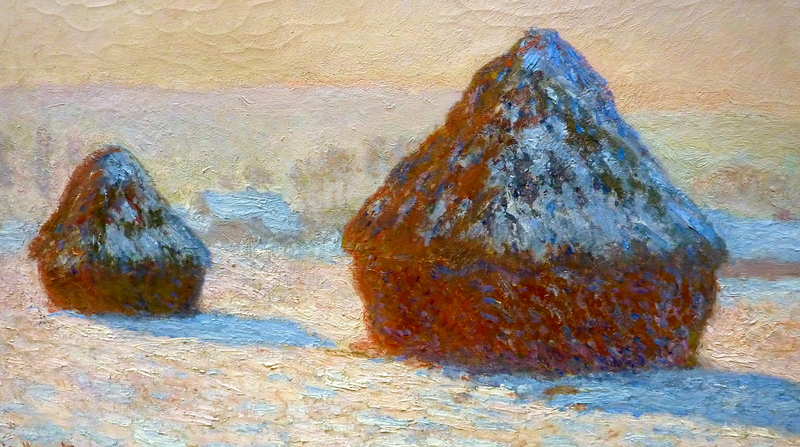 It was not until we were driving home that we heard the news about the previous night’s art heist. 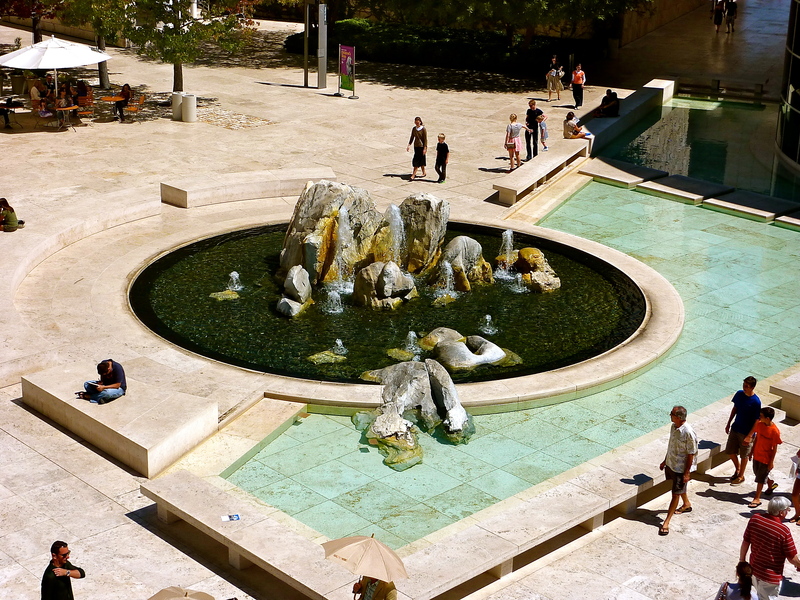 Oh well, up until that point it had been a splendid four hours at the Getty Center, a venue we had not visited since a San Diego State Alumni function more than a decade previously. In true Aztec tradition, on that evening there was alcohol involved, so it’s amazing I didn’t end up on the canvas by night’s end. My recollection of the art was minuscule at best, or in a phrase more apropos for the moment, I was a minimalist when it came to remembering any of the paintings. So on Sunday, with Carmageddon now just an overblown, overhyped distant memory in our rearview mirror, Tracy and I drove to the Getty Center Drive exit, paid our $15 to park in the underground garage and took the Tram up to the Getty Center where we would meet up with our friends Bob, Melinda, Susan and Rob. We would also hook up with artists like Rembrandt van Rijn and paintings like A Young Scholar and His Tutor. A few minutes later, they disembarked from the next tram, and the six of us were off to explore the world of art. 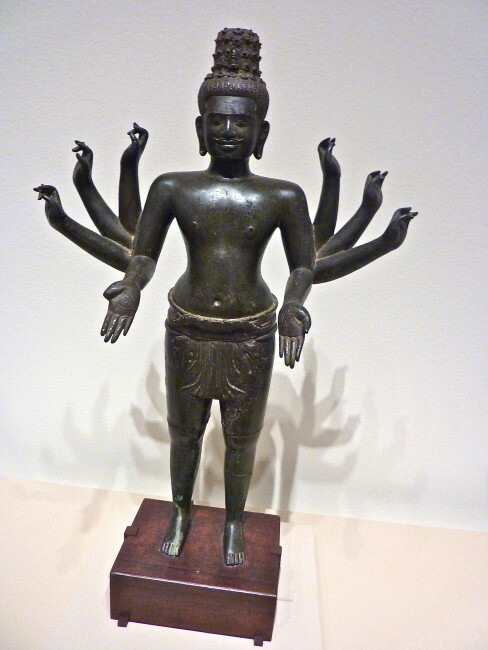 For some reason, the group decided to follow me (usually not a wise decision), so I led us into the North building, not only because it was the closest, but because this was the last day of the special exhibition, Gods of Angkor: Bronzes from the National Museum of Cambodia. 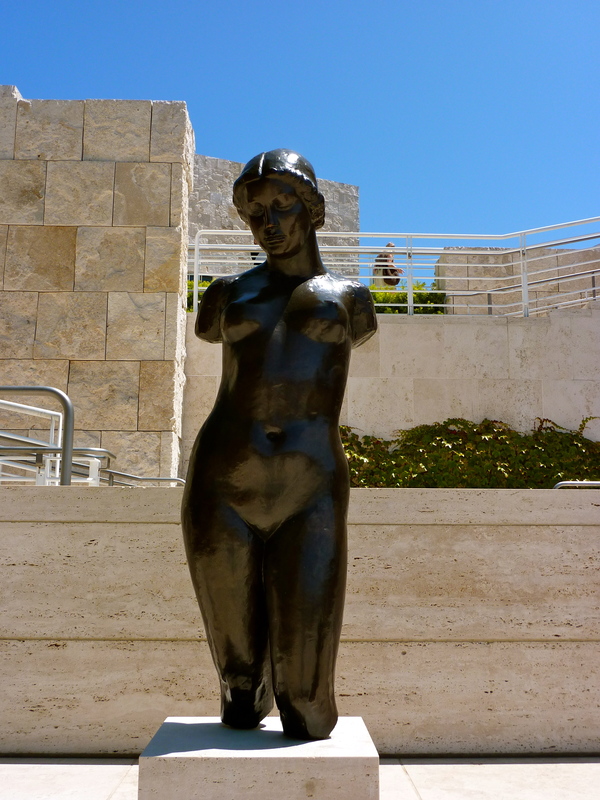 In the print ads, these bronze figures looked lifelike and gigantic. I think we were expecting The Attack Of The 50-Foot Khmer People. However, in person, they looked as if they had smoked two packs of cigarettes since the day they were born, and it had stunted their growth. They were quite tiny in size. This was one of the anchors (or Angkors as it may) of the exhibition. I’m confident they were all historically significant pieces. I mean something more than 1,000 years old is nothing to sneeze at. Just look at Hugh Hefner. 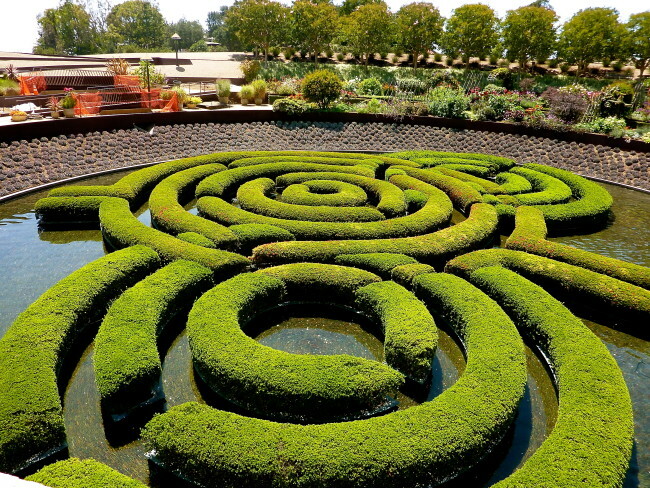 We could have learned all about these artifacts had we taken the time, but being from “what have you done for us lately (and quickly)” Southern California, we wanted something more exciting, and more importantly, bigger. 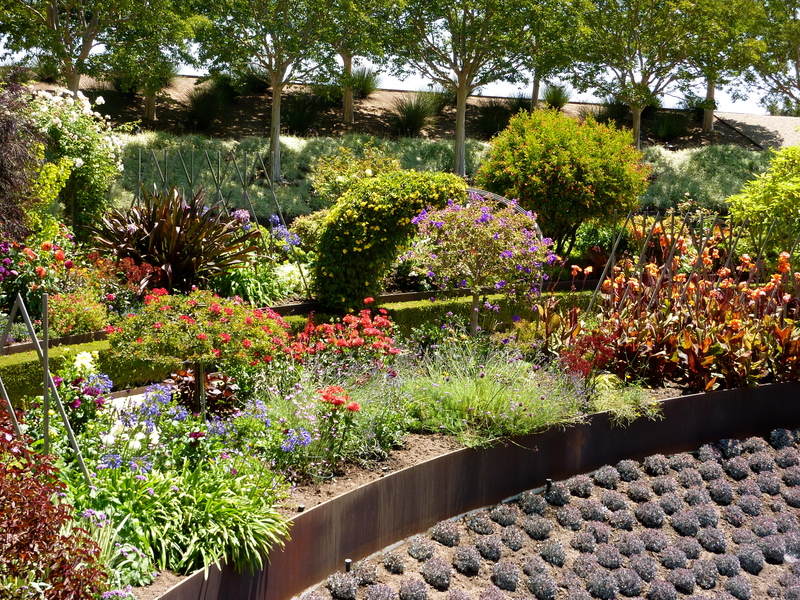 This, of course, reinforces the Los Angeles “it’s all about me” attitude. Leaving the special exhibition area, we turned on our five dollar Audioguides, and it was time to see what the Getty’s permanent collection had to offer. First up was some stained glass that caught our interest. The one below was probably from Switzerland in the late 1400s, when families could afford stained glass to be used as inserts in their windows at home. 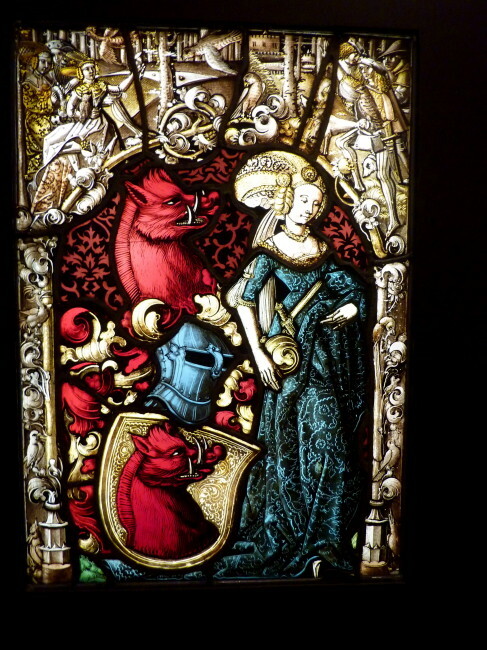 The stained glass above is from a church in French Lorraine or Burgundy from the early 16th century. 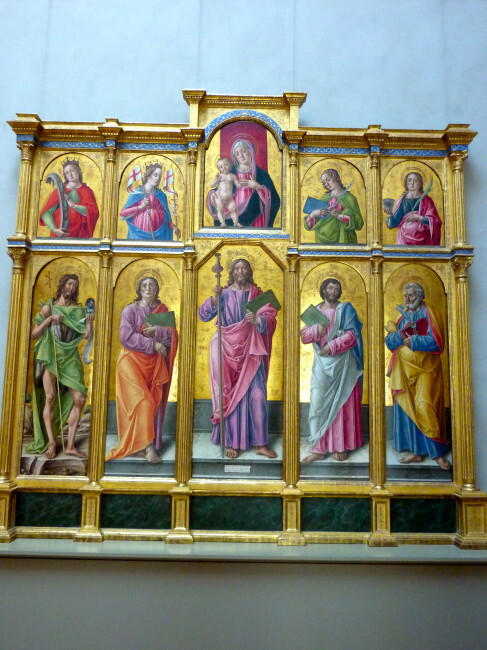 There was also a beautiful altarpiece. 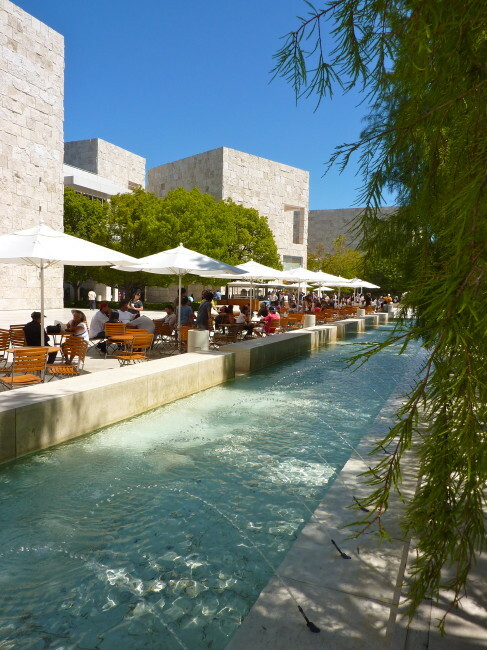 Weaving our way through the various rooms, seeing paintings from the 15th and 16th centuries, we were enjoying the Getty. 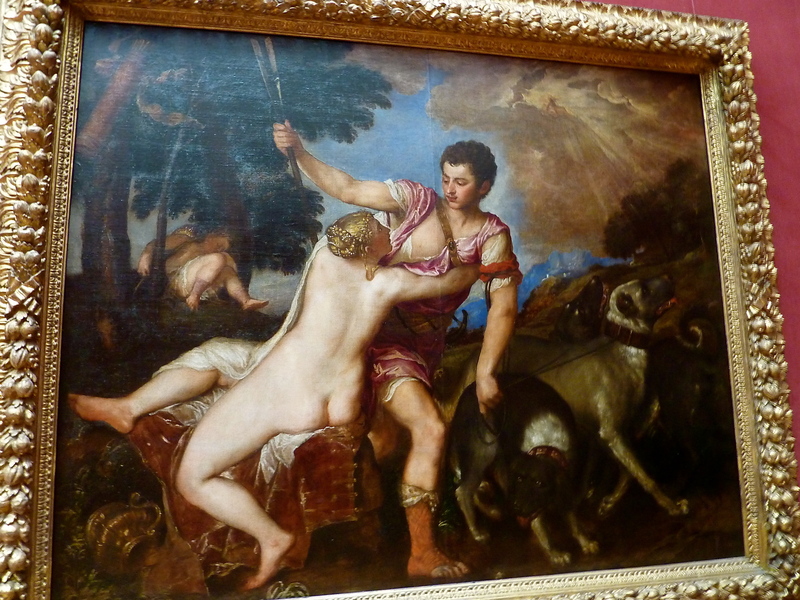 One that stood out was one by Tiziano Vecellio (better known as Titian) from the mid-1500s (left). The painting, Venus and Adonis, depicts the goddess Venus trying to keep her lover, Adonis, from going out on a hunt. Like most guys, he didn’t listen to her and was subsequently killed by a wild boar. On the right is The Laundress by French artist Jean Baptiste-Greuze. 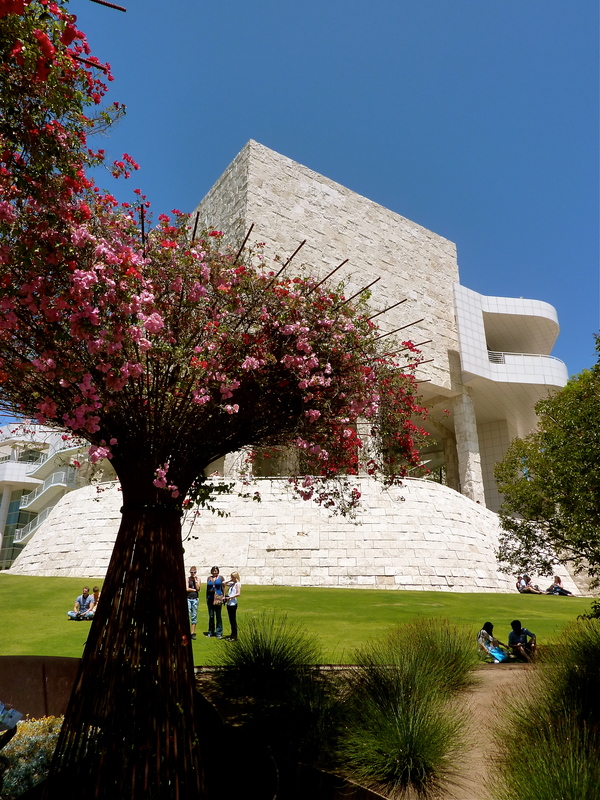 As Rod Stewart once told us, “Every Picture Tells A Story,” and the Getty is full of them (pictures and stories). The Audioguide gives details (sometimes too many details) on numerous numbered paintings. 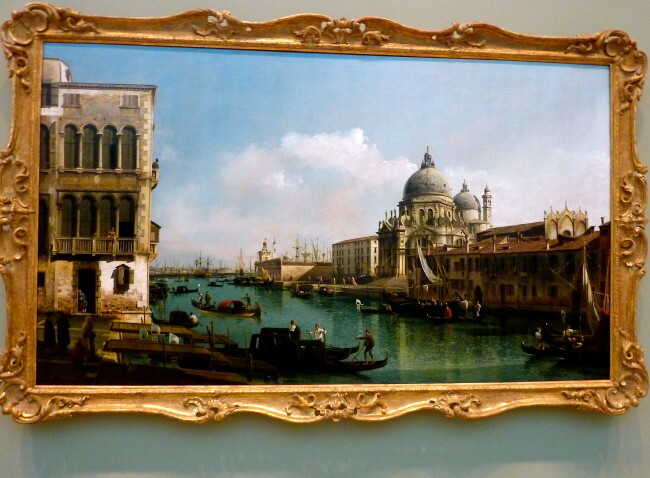 On the left is The Entombment of Christ by Peter Paul Reubens, while on the right is A View Of The Grand Canal by Bernardo Bellotto. There certainly was a story related in Georges de la Tour’s The Musicians’ Brawl (below). 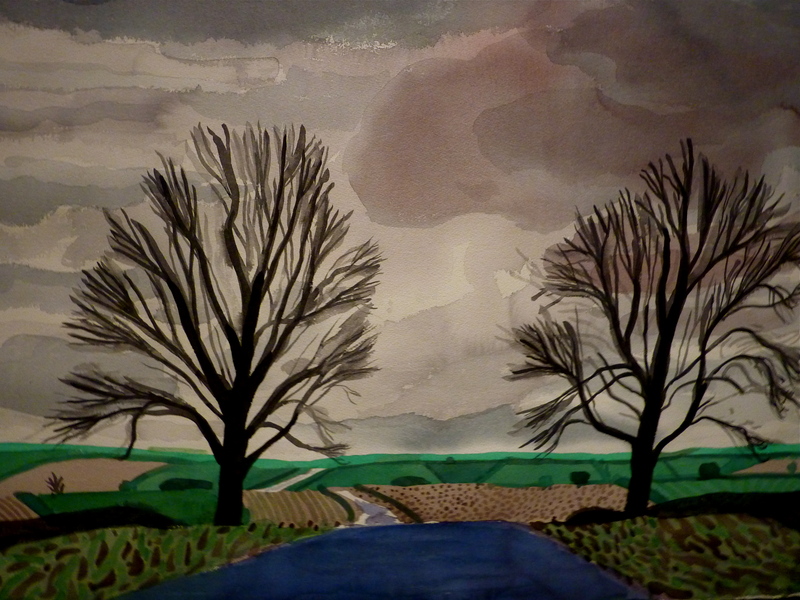 I liked this one. 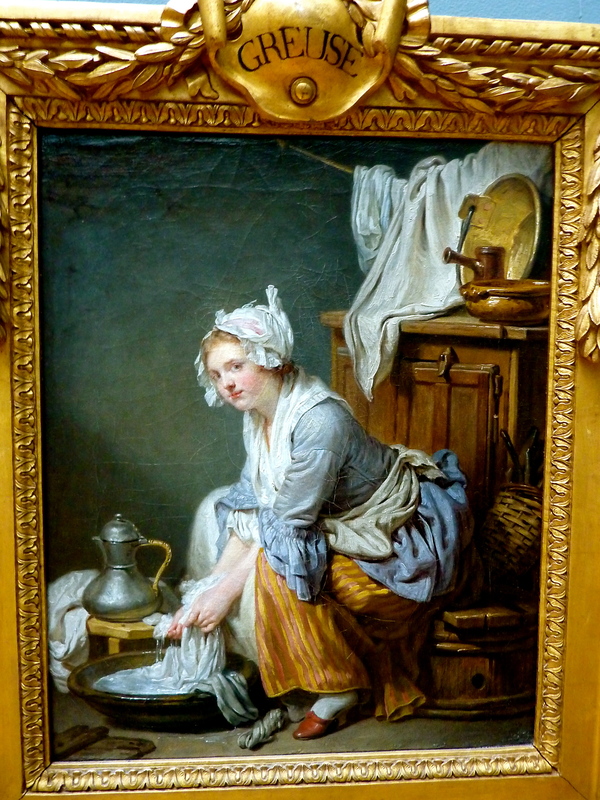 In the painting, a brawling musician (thus the title) squeezes the juice of a lemon into a guy’s eyes. The victim of the attack is supposedly blind (like that fake blind guy in Paris who tried to rob me once), and the musician was trying to expose this ruse. 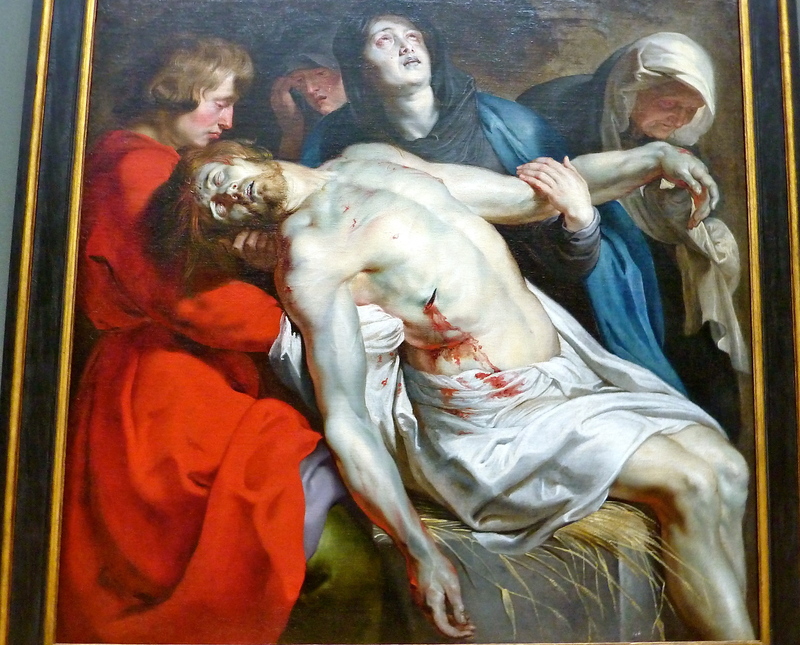 The facial expressions in this painting were quite lifelike, and I felt like throwing a punch, too, but a nearby museum guard would have none of that. 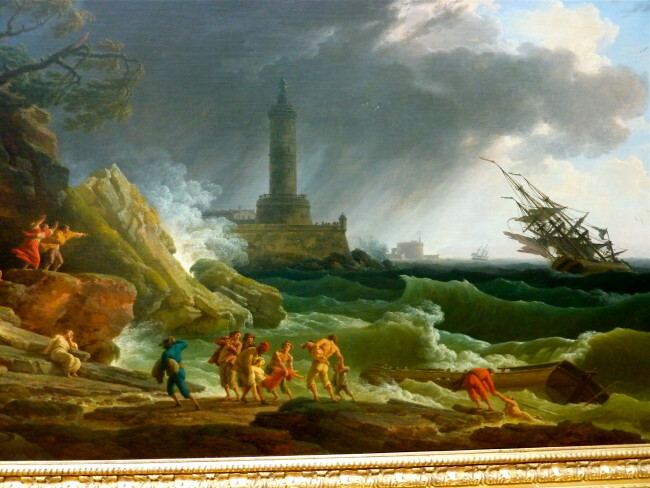 This painting is titled, A Storm On The Mediterranean Coast, by Claude-Joseph Vernet, who was the most famous French landscape artist of the 18th century. We must have wandered into the East Building because the paintings were now from the 17th century. 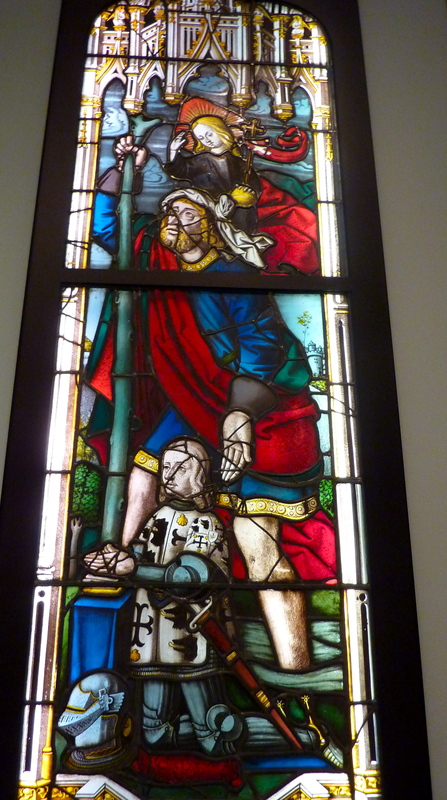 I was getting so much into the art, I kind of lost track where I was in the Museum. Fortunately, Tracy kept me in line. 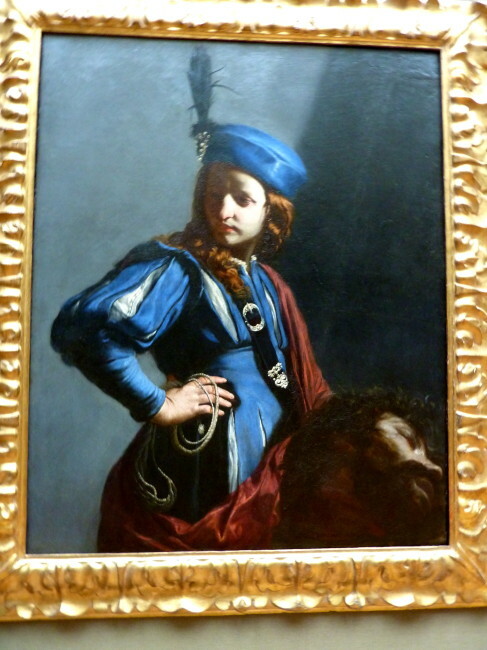 Cagnacci’s David With The Head Of Goliath and Peter Paul Rubens The Calydonian Boar Hunt stood out for me. Next was a painting ripe to be stolen. Just kidding, but it was by Rembrandt. 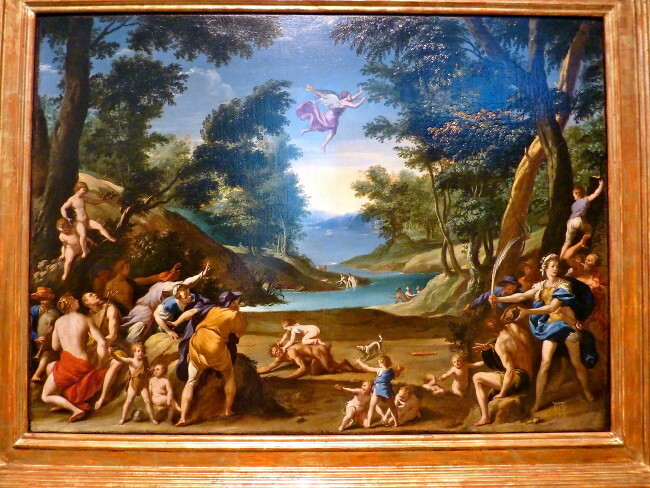 The Abduction of Europa. Jupiter, King of the Gods, had a thing for the Princess of Tyre. So much so that he turned himself into a white bull. Properly seduced, Europa hopped on Jupiter’s (aka the bull’s) back and was whisked away to a far off land that now bears her name. 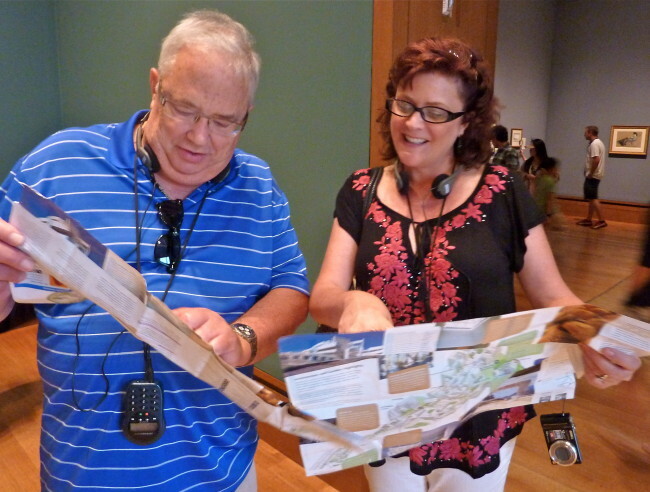 Soon I knew we were in the South, and it had nothing to do with the accents of the museum guards. I knew we were in the South Building because all of a sudden I had a strange sensation that a famous television host/convicted criminal would show up. It is in this area of the Getty where vases, clocks, furniture and other wares from centuries gone by are displayed. Tracy remembers that when we were here previously, I called this area the Martha Stewart Collection. I blame copious amounts of wine that evening for my lack of memory. It’s my story, and I’m sticking to it. Tracy and I particularly liked the chandelier where people used to put goldfish in the bottom of the fixture. 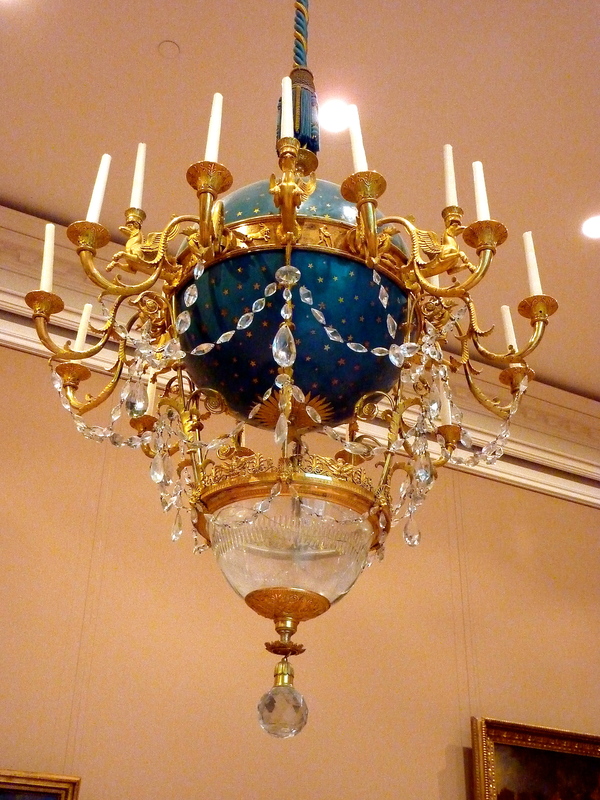 The lustre á poissons (chandelier with fish) is from the early 1800s and has the look of a hot air balloon. 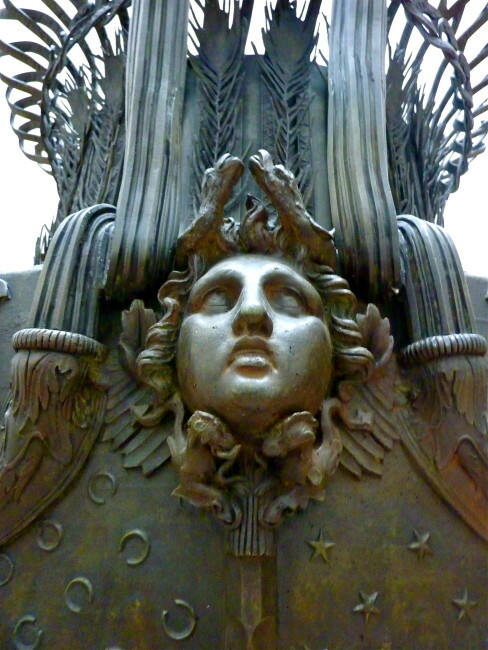 It has the twelve signs of the Zodiac, and the blue globe containing twelve stars depicts the heavens. When asked about the fish thing, Gérard-Jean Galle (the designer of the chandelier) said that the goldfish swimming in the water, “amuses the eye most agreeably.” There were no fish today. Right about now, Tracy and I wanted to amuse our stomachs, so we met up with the gang at the outdoor cafe. There is a more expensive restaurant on the premises that is a bit more formal, but we all opted for the least costly alternative. Various varieties of sandwiches, chips, and drinks cost about $15.00 per person. 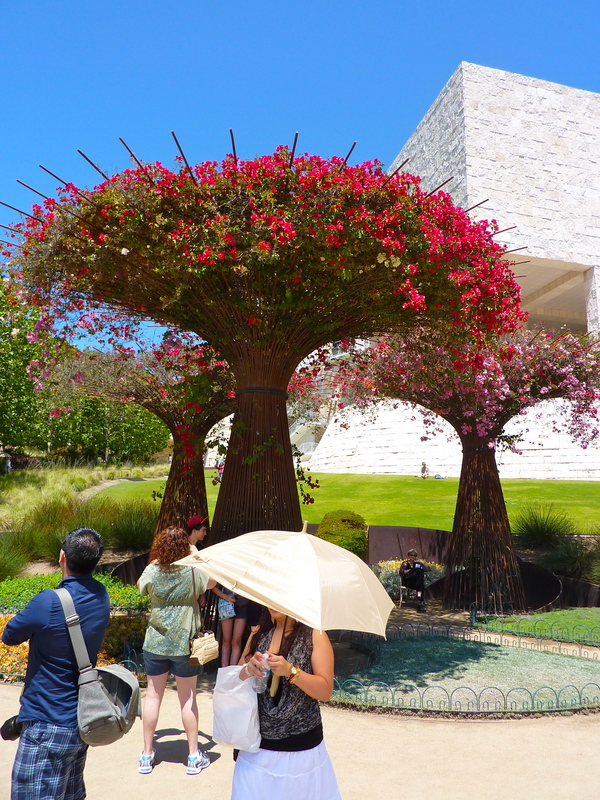 It was a beautiful day, so the next stop was the outdoor garden, where we could not only look at beautiful flowers and a water maze but the incredible architecture that is the Getty. 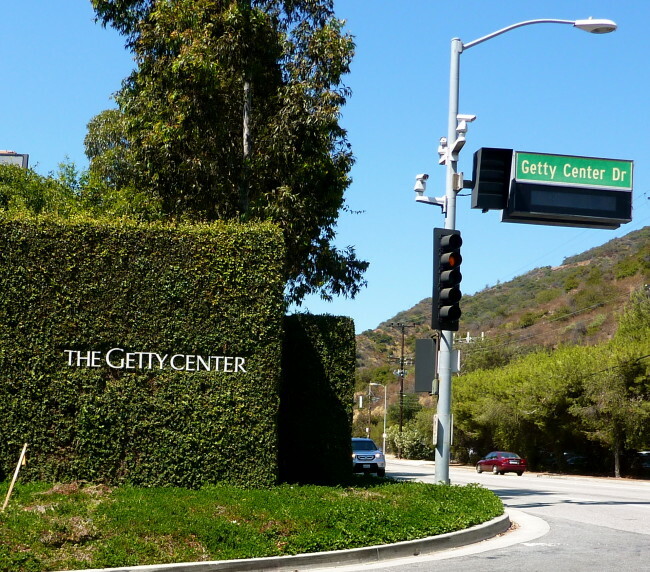 I thought I heard Horace Greeley say, “Go West young man,” but it was just Bob saying we should head for the West Building, where there were some big-ticket paintings by famous artists awaiting our arrival. Tracy and Bob checked our bearings, and we were off. 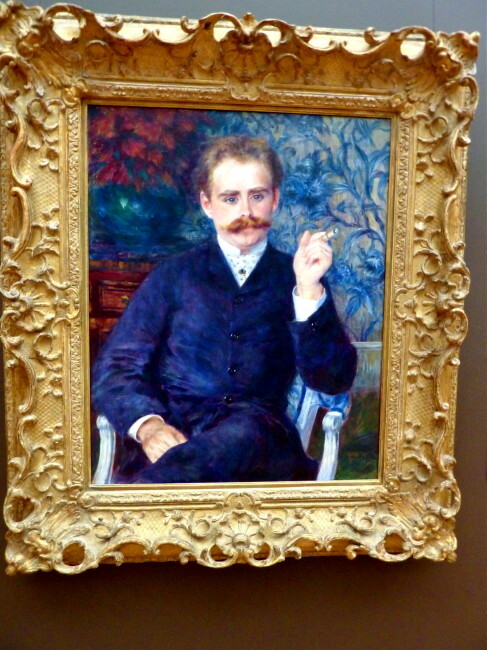 We arrived in a room that contained works of Degas, Van Gogh, Monet, Cezanne, Gauguin, Renoir, and Manet. 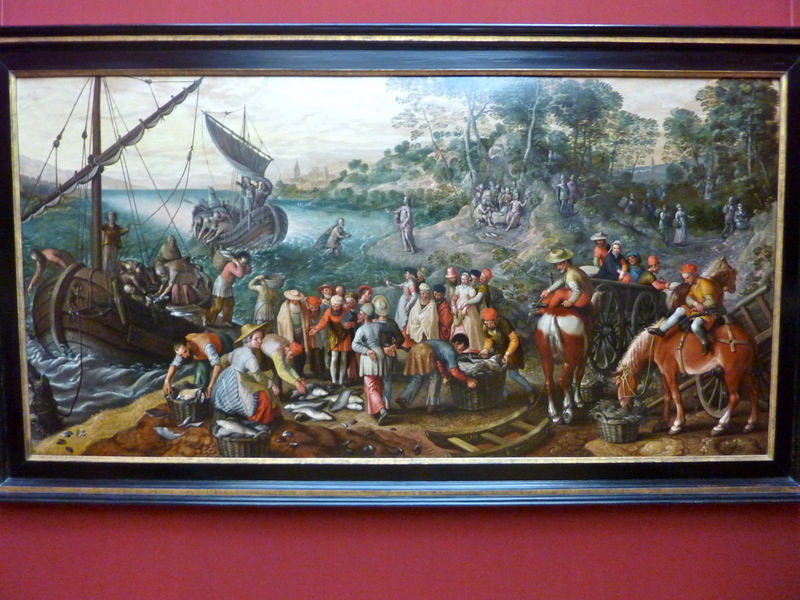 The guards in this area were on high alert, and anyone who was coming too close to these paintings was given a stern warning to back off. 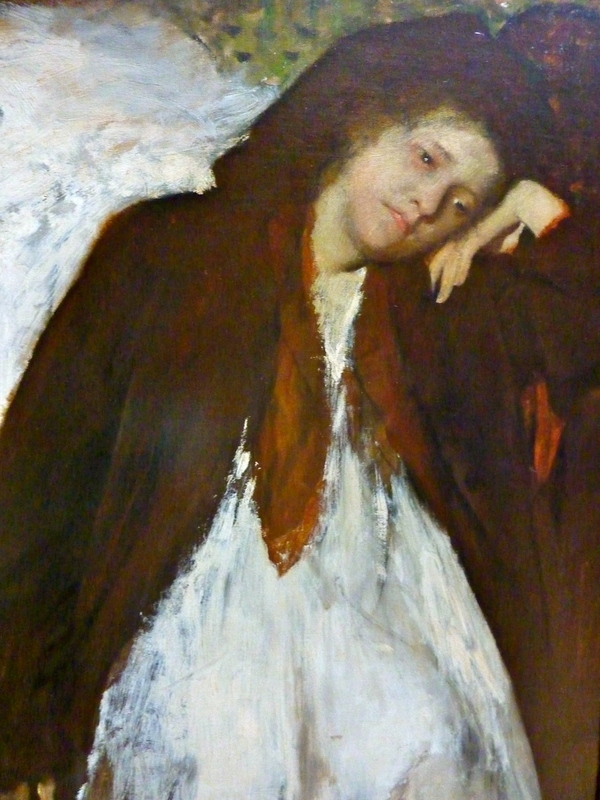 The Degas painting was The Convalescent, purported to be a cousin of the Frenchman that he visited in New Orleans during the early 1870s. 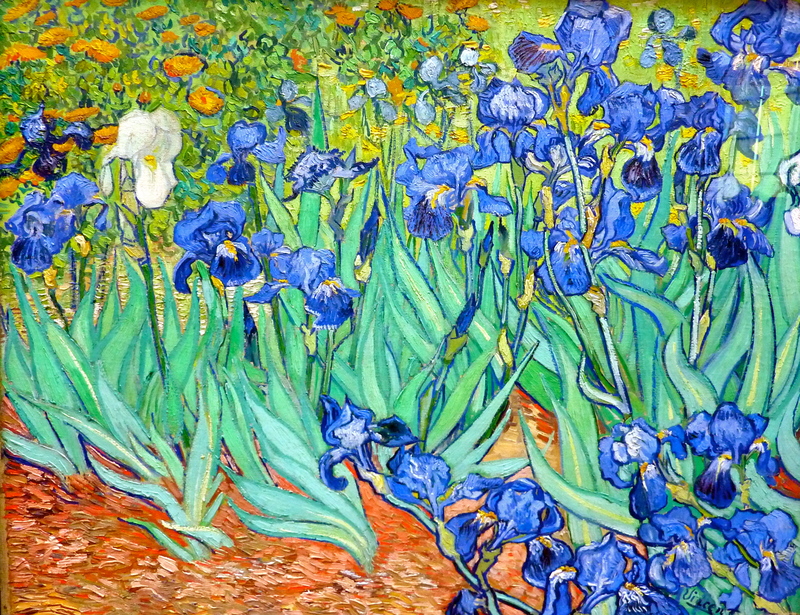 Van Gogh’s work was Irises. These flowers were located in the garden of his Saint-Rémy asylum and were painted shortly before his death. 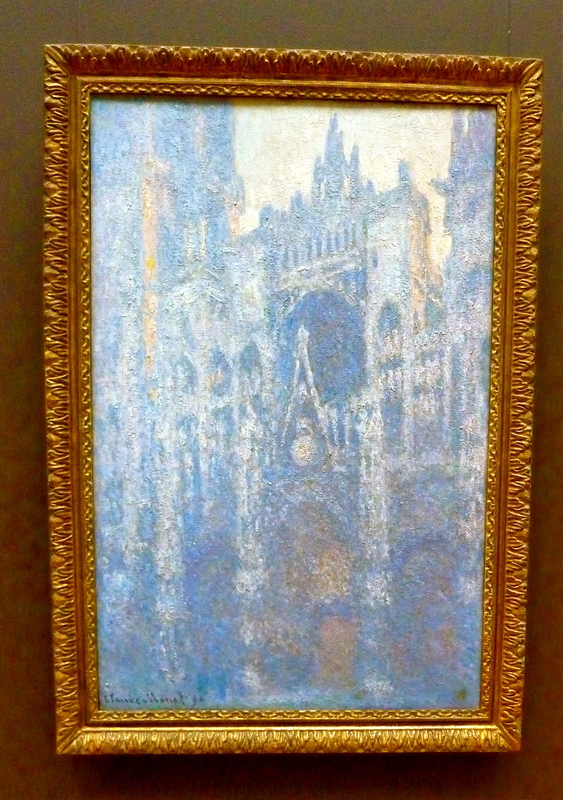 Then a couple of Monet’s pictures came into view. The Portal of Rouen Cathedral in Morning Light and Wheatstacks, Snow Effect, Morning just reinforced why I love Monet. 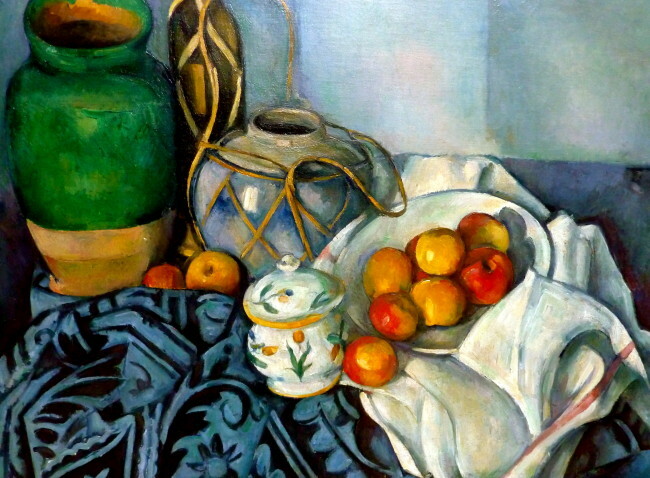 Cezanne’s Still Life With Apples was nice but made me hungry again. Renoir’s Portrait of Albert Cahen d’Anvers depicts the composer who wrote light operas. 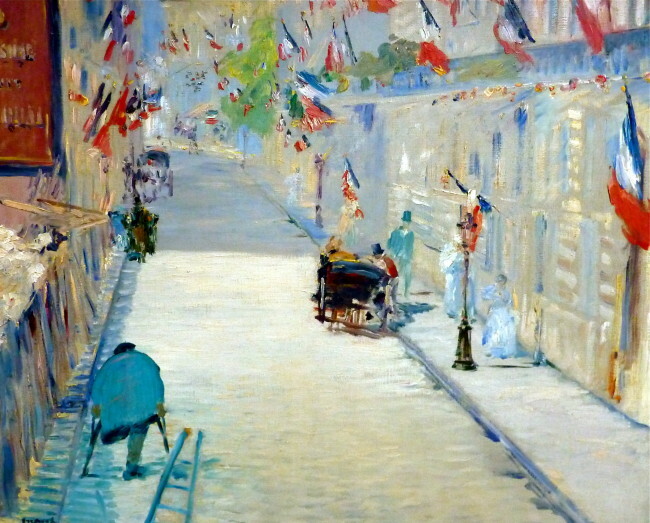 My favorite painting in this area was one by Manet entitled The Rue Mosnier With Flags, painted in 1878 as Manet looked out his window on a French National holiday. 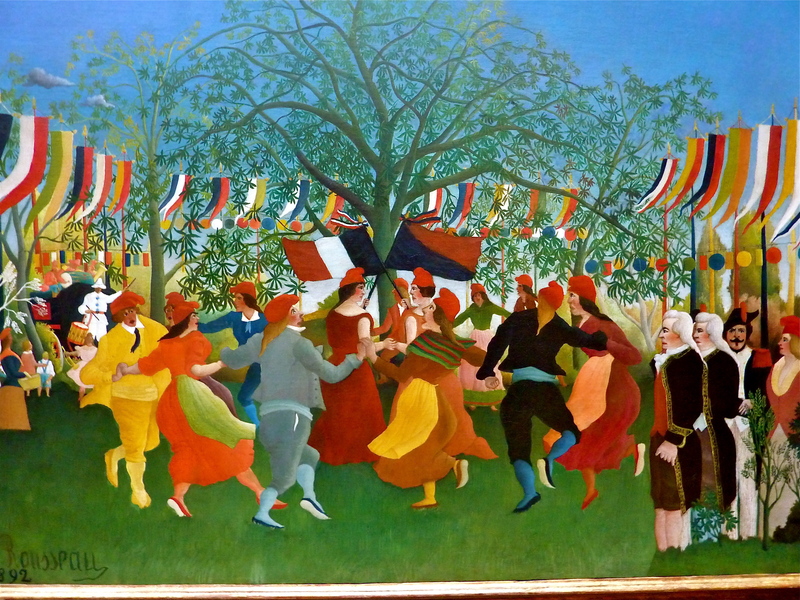 Tracy’s favorite, located in the next room we entered, was called The Centennial of Independence by Henri Rousseau (also known as Le Douanier). French peasants celebrate the centennial of the founding of the French Republic in 1792. 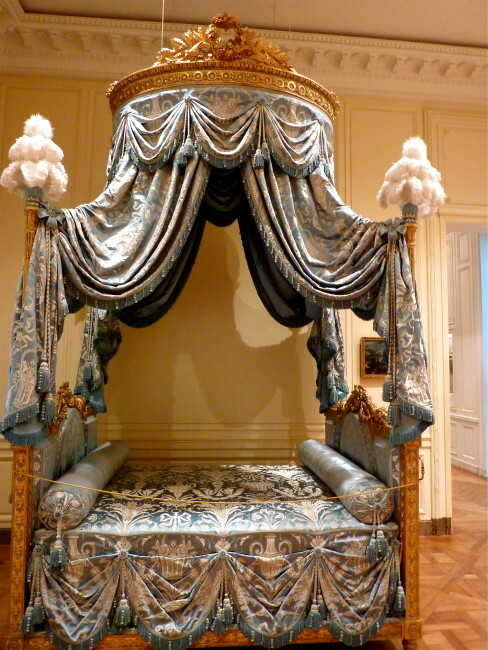 It was getting late in the day, and we only had a couple of rooms to go to. 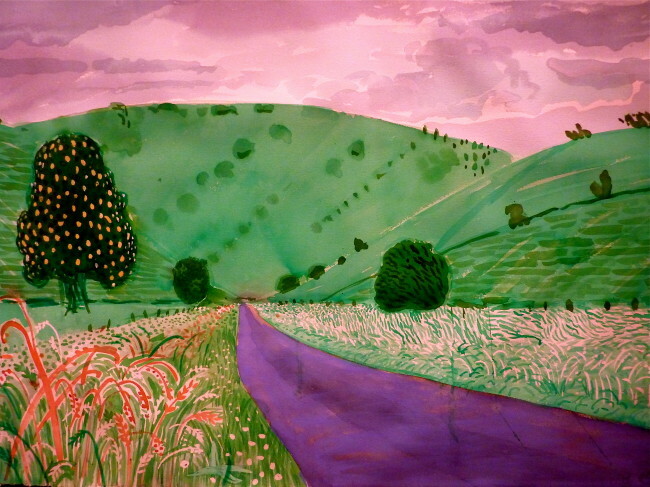 We enjoyed a couple of watercolors by British-born David Hockney. 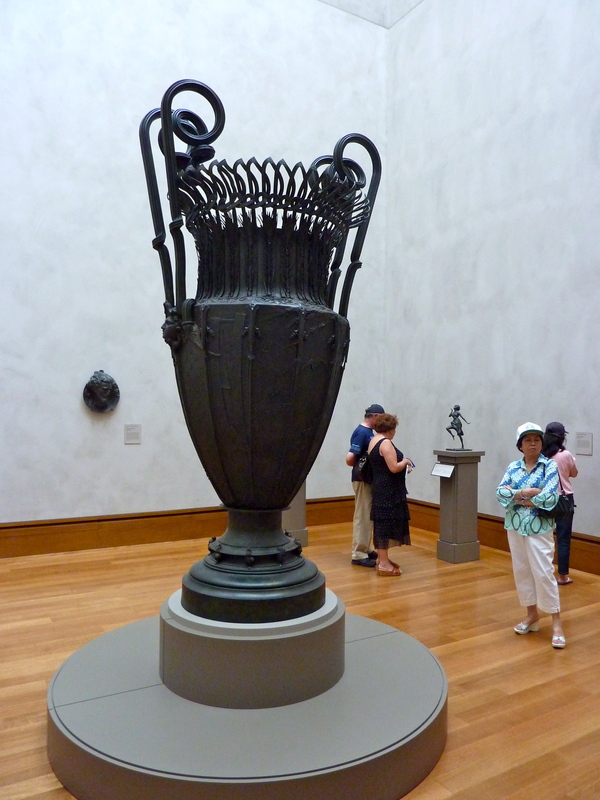 In the following room was a vase that more than made up for the lack of size of the first exhibition. 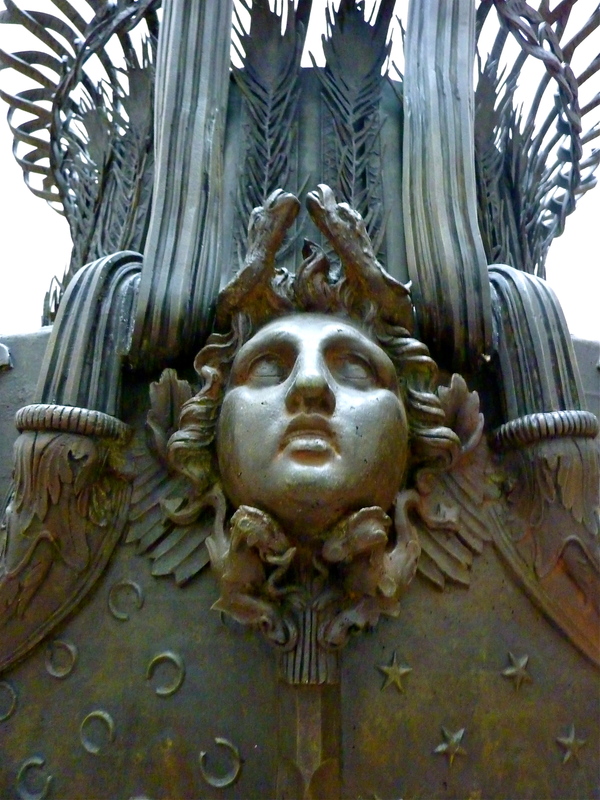 In the middle of a room was a bronze and copper vase that was first exhibited at the Exposition Universelle in Paris back in 1889. It was based upon an ancient Roman mixing vessel from Pompei that the artist (Jean-Désiré Ringel d’Illzach) saw on a visit to the Archaeological Museum in Naples more than ten years earlier. The detail was amazing. Our four friends stayed behind (we had gone a little faster in the first loop before lunch), so we bid them goodbye and went up an elevator in a building that Tracy thought housed another exhibition. 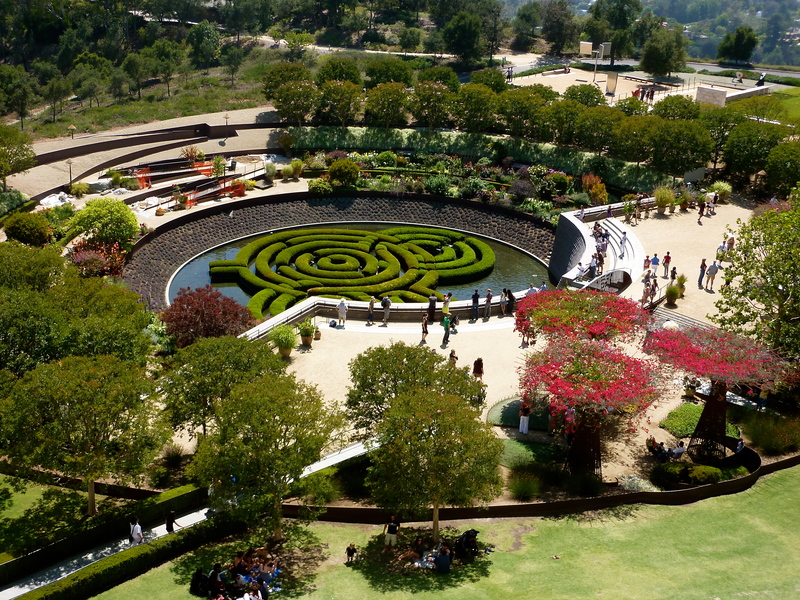 Although it was closed, it gave some excellent final views over the museum complex. After four hours, Tracy and I were done. 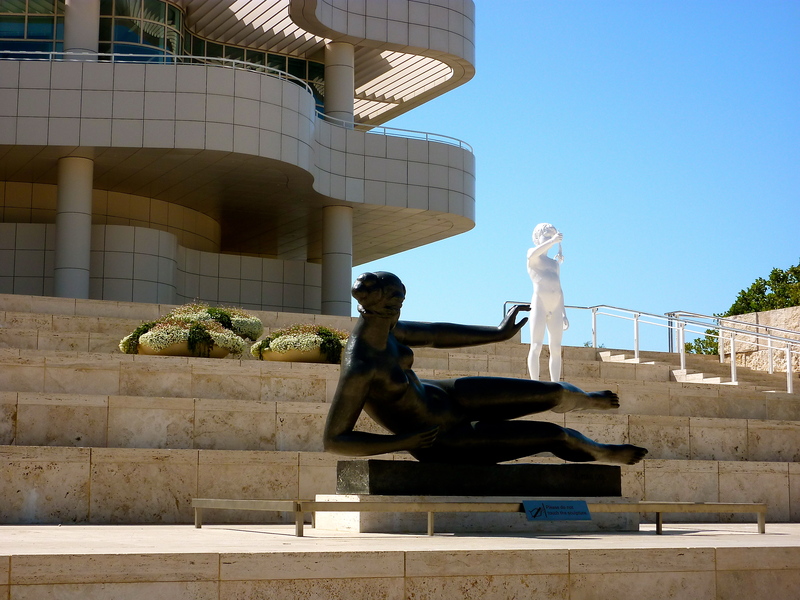 It had been a beautiful day at the Getty Center with our friends, and no priceless pieces of art had been damaged during our stay. We rode the tram back to the parking lot, and after disembarking, we were amazed at the maze we saw. Unlike the beautiful maze in the garden, we saw an ungodly number of people waiting in line to get on the Tram. This was at 2:45. 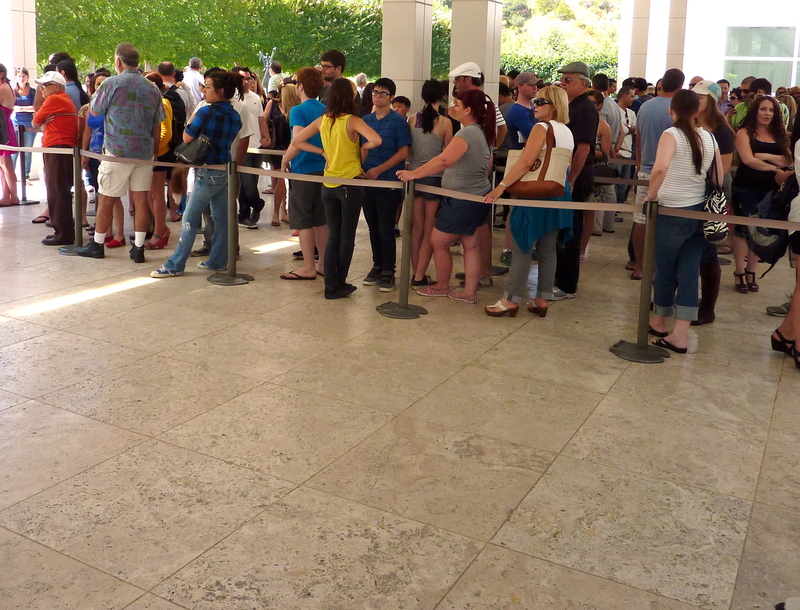 Melinda told me the next day that the line was really long an hour later when they left, meaning those people would only get about an hour of viewing time before getting the boot. BE SURE TO ARRIVE EARLY!!! There were no lines when we arrived at about 10:15 a.m. 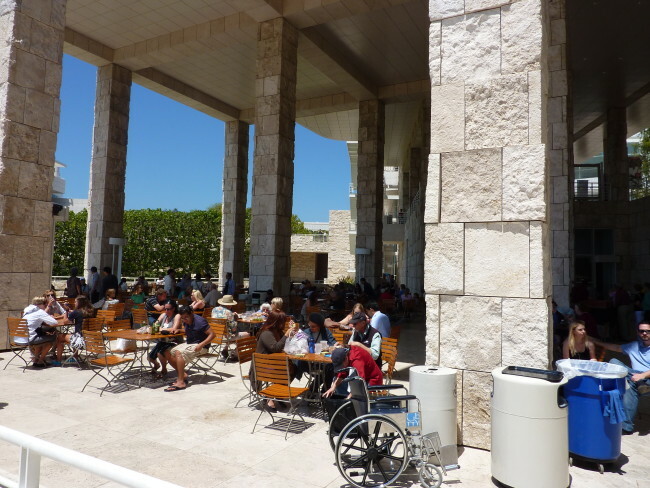 The Getty Center is a great venue for locals and visitors alike. 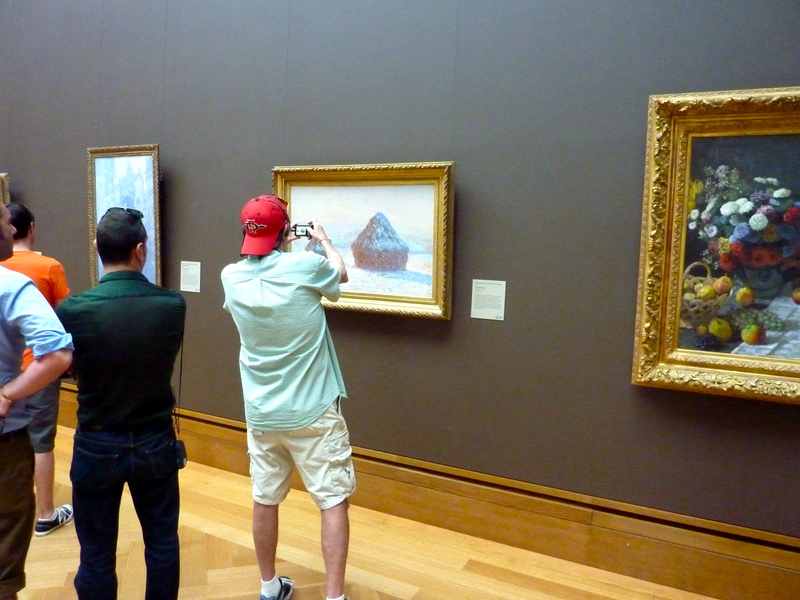 A word of warning: Try to avoid people wearing San Diego State caps backward attempting to take photos of the art. These “idiots” are very annoying.